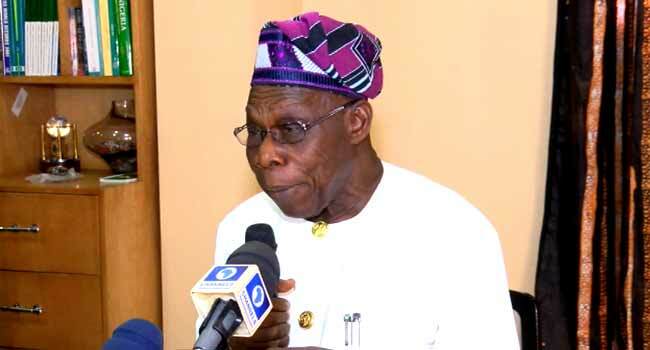 Former President of Nigeria, Chief Olusegun Obasanjo yesterday expressed his grief on the present state of Nigeria. He said Nigeria is more divided now than it was during the Civil war. He made the statement during the general yearly meeting of the Association of Chief Audit Executives of Banks in Nigeria (ACAEBIN), in Abeokuta. He also lamented the high level of illiteracy in the Northern part of the country, the insecurity of the nation, etc. “The first is politics which is governance. Unless we get governance right, any other thing we are trying to do will not be right. The second is population. Our population at independence, we were estimated to be 45 million, but today we are 200 million. By the year 2050, we will be over 400 million. Normally, population should be an asset but looking at the condition we are in now, when in the North-East of percentage of adult literacy is about 53 percent, you can see that, we have a problem and education is basic in all human development. “How do we think of setting education to be useful? Those people who will make our education over 400 million in some years time are already born, and you cannot unborn them, so the problem is here, what do we do? “We must provide education for them, housing, healthcare, education for them, and more importantly, employment for them." He also talked on Employments in Nigeria, urging banks to pay more attention on Agricultural Sector and Business. “The next one is prosperity, I am not being bothered about Nigeria’s poverty or Africa poverty. Nigeria have everything to generate wealth. We have God’s given resources under our soil. We also have human resources. If we bring these together, then, we will definitely get prosperity." “Another one is protection, that is security. People must be protected in all aspect. Protection of lives, protection of property and the people can actually feel that they are protected,” he said.